Most educators today beg for smaller class sizes. Not Josh Rist, choir director at McNary High School in Salem. “I want 100 kids in my class,” he says, describing a time when he did indeed have 100 students in his women’s choir class. “For our choral program, we love that,” he says, explaining that, where huge class sizes are a detriment to most programs, this is not the case for music education. He jokes that in an area of education suffering from cost-cutting measures, placing 60 or more kids in a music class is not only desirable, but economical, too. Managing large class loads is just one challenge today’s music teachers face. In an era rife with budget cuts, high-stakes testing and the Common Core, mu- sic education across the state has suffered.“It’s the first to go and the last to come back,” says Mary Lou Boderman, coordinator of music and drama for the Salem-Keizer School District. 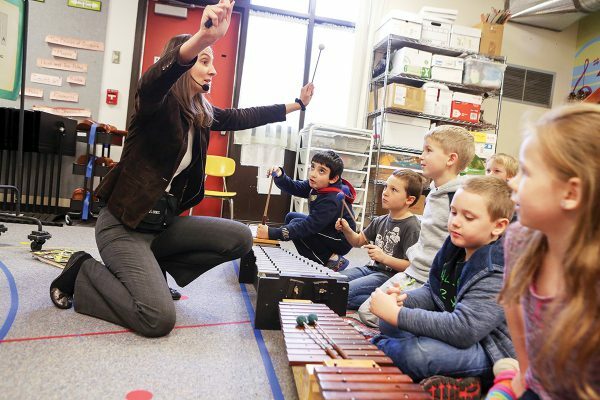 Yet, in the face of adversity such as shrinking budgets and staffing cuts, one would be hard-pressed to find a group of people as passionate about their profession as Oregon’s music teachers. The state of music education in Oregon today varies. Some districts, like Salem-Keizer, have thriving programs that successfully educate hundreds of K-12 students each year. Other districts, forced to make hard budget decisions, have slashed funding from music departments, leaving educators to build programs from practically nothing. Considering the vital nature of an arts education, this disparity is concerning. Jennifer Mohr Colett, who teaches general music at Fir Grove Elementary School in Beaverton, has made advocating for equal access to music education her focus over the past several years. During the day, Colett teaches music skills and concepts to elementary students. She also serves as advocacy chair for the Oregon Music Education Association (OMEA), a nonprofit whose purpose is to provide professional development for music educators and music opportunities for students in the state. As advocacy chair, one of Colett’s main roles is to increase student access to music programs across Oregon. When OMEA asked her to step into the position, it had been vacant for a year. She jumped into action by pulling together a meeting of the minds with music coordinators from around the state. Immediately, the ideas began flying,“We started just really bubbling with excitement and connecting and strategizing about how to make sure that all students have access [to a quality music education program],” she says. Once the OSMAP census is complete and data is available, OMEA’s goal is to “offer actionable guidance to stakeholders for remedying inequities where they exist,” according to the OMEA. In other words, data will be presented to school boards, administrators, and state legislators with the hope that more equitable funding can be secured to provide all students with access to a high-quality music program. While the data will help to convince stakeholders holding the purse strings, educators in the trenches already know what the report will reveal: music programs across the state have suffered drastic cuts. Some districts, thanks to creative administrators and teachers, have maintained programs in spite of cuts. Some have even prioritized funding music education, choosing instead to cut elsewhere. Other schools, particularly in low-income areas, limp along with music programs that are mere phantoms of what they were before. So, why is music education so important and what does a thriving program look like? 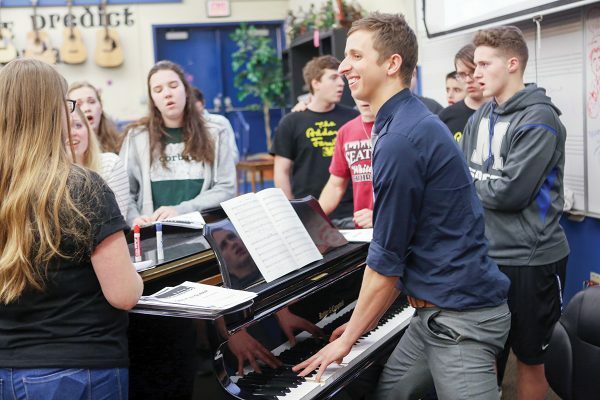 The more students, the merrier for Josh Rist, choir teacher at McNary High School in Keizer, Ore.
A concern many music teachers share is that music is viewed by the general public, students, school boards, and even fellow teachers as supplemental. Encore classes, not core classes. Clubs. Specials. Fluff. The benefits of music education, and arts education in general, have been well-documented. According to an ever-growing body of studies, sustained involvement in arts education results in increased academic achievement, improved attendance and higher graduation rates. Additionally, involvement in a quality arts program is proven to have positive social outcomes for students, including citizenship and professionalism. What is of great interest to many stakeholders is the fact that these findings are particularly true for students at risk due to poverty. Teenagers and young adults of low socioeconomic status (SES) who have a history of in-depth arts involvement show better academic outcomes than do low-SES youth who have less arts involvement. Young adults who had intensive arts experiences in high school are more likely to show civic-minded behavior than young adults who did not. Many music teachers note that all students need to find their niche, their place to belong that gives them a reason to return to school day after day. For some, this is sports, for others it is yearbook or student government. For many, it’s music. 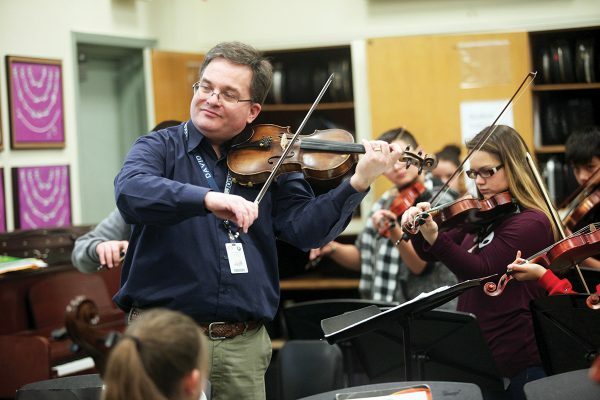 “Every kid has got to have their thing,” says Dave DeRoest, orchestra director at Waldo Middle School in Salem-Keizer. “Every kid needs a place to belong, a community, a family, a subset of kids that care about them.” DeRoest notes that his students’ attendance rates and test scores beat the school average, which he attributes to their desire to be in school. Music provides a motivation for students to keep coming to school. And, music builds professional skills that students will need in college and the workplace. Ken Graber, choir director at North Bend High School, compares his music program to an extended family. According to Jennifer Mohr Colett, the recipe for a successful music program includes both excellent teaching and a robustness in the diversity of classes offered. Students engaged in music are activating multiple parts of their brains, which is one reason it is so powerful. Musicians in a very real way are “speaking ” multiple languages at once: the languages of rhythm, pitch, volume, dynamics, and reading music, to list a few. The Salem-Keizer School District has what many educators believe to be the gold standard in music programs. “The community supports what we do,” says Boderman, the district’s music and drama coordinator. “It’s a badge of honor for them. The business community sees it as a selling point. It’s not unusual for parents and community members to advocate against cuts. The school board and administration understand what we have here. Multiple generations have gone through a relatively stable music program.” Boderman has been in education for 41 years. She coordinates about 100 music staff for Salem-Keizer and has seen trends in education come and go. Along with Colett, she was instrumental in implementing the OSMAP census. She credits the district’s thriving music program to a number of attributes. An exemplary group of teachers is the real key to a successful program, she says. This involves not only hiring the right staff and placing them in the perfect position but also making sure they receive regular professional development. Boderman takes a unique approach to hiring and staffing her district, an approach she says is enormously successful. She explains that in many districts, the building principal hires a music teacher to fill an open position. Not so in Salem-Keizer. Boderman and district administrators hire teachers according to specialty area, assigning staff and aligning schedules in vertical format. “It’s an enormous puzzle,” she says. Many music educators point out that music education is a serious academic pursuit, though it is often overlooked as “just” an elective. Music teachers base their instruction on standards, just like any other curriculum or subject area. A rigorous music program should be sequential, sustained, and standards-based. Dave DeRoest is proud of the middle school orchestra program, one of the cornerstones of Salem-Keizer's music education program. Quality administrators who value music education are not to be overlooked, says DeRoest. He sings the praises of his principal who, he says, has not missed a single evening event since he started at Waldo Middle School. The recipe for a successful music program involves more than just excellent teachers and supportive administrators, however. There must be a robustness in the diversity of classes offered as well as in the classroom. Colett believes that music education should be compulsory in elementary school, when young students soak up music instruction like a sponge, just as they would any other second language. Then, in the secondary level when music becomes an elective, the participation in these programs should look like the population of the schools. 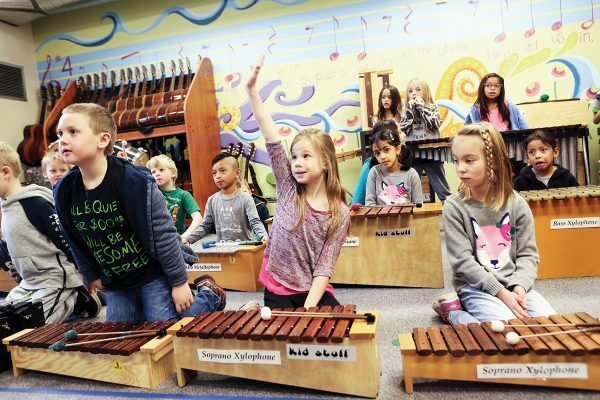 Music education begins at an early age in the Beaverton School District. There are many concrete steps that fellow teachers and community members can take to advocate for strong music programs in Oregon schools. The OMEA hopes to raise awareness about a hopeful sign. The recently passed Every Student Succeeds Act (ESSA) that replaced No Child Left Behind specifically enumerates music as an essential component of a well-rounded education. This does not mean that districts suddenly receive more funding for music programs. Rather, it means that districts can use new Title IV funds to support music programs in their schools if they so choose. This means convincing districts of the importance of music programs – which shouldn’t be a hard sell, given the data that shows how impactful arts education can be. “Our ideal would be to see every school district in Oregon commit to music in a way that Beaverton has, in the way that Salem has,” says Colett. “Ultimately we have to foster community value for music and we have to teach communities how to keep their programs and promote their programs and save their programs should they ever come under threat.” That aside, music educators note that there is something to be said about producing art for its own sake. Classroom teachers outside of the music disciplines can help support their colleagues in this noble pursuit. Music educators battle the perception that they aren’t “real” teachers and that they are “only” teaching electives. Some argue that it’s time to end the divide and band together to ensure students have the well- rounded education they need to succeed. Perhaps Graber says it best. We know conclusively that music helps students succeed in school and in life. "If it’s valuable, then we need to invest in it,” he says. Indeed. And there are many passionate educators working tirelessly in Oregon to see to it that we do.